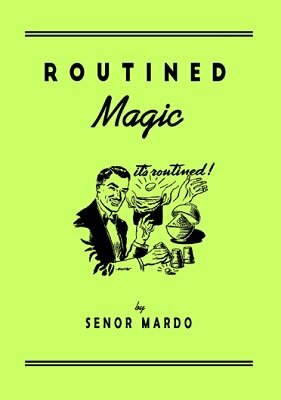 Two classics of magic: the Cups and Balls and the Egg Bag, are beautifully routined and patiently explained in text and illustrations, as only Senor Mardo can. Experts in magic agree that Mardo's "new thinking" in these routines make them a knockout addition to most any performer's act. You get over a dozen effects and moves with coins, silks, thimbles, balls, cigarettes and a complete explanation of Mardo's improved gimmick for the Chinese Rice Bowls that will make you want to add it to your show. This is baffling, thrilling, entertaining magic with headline appeal. "Lovers of intimate magic will find many items of interest. Routines with the egg bag, cups and balls, and thimbles are especially good. Mardo demonstrated a few of his moves with the egg bag for me while I was in New York. This one item is worth far more than the price of the book." - J. G. Thompson, Jr.
1st edition 1945, PDF 49 pages.